Don’t let the obvious styling similarities to the CLS 63 fool you. With the CLA 45, Mercedes-Benz and AMG have actually gone quite sensible. We cannot display this galleryA glance at the model’s spec sheet suggests I’m talking the drivliest of drivel. Yes, in both the new CLA 45 AMG and its sister model – the entry level A 45 – Mercedes has forsaken its traditional stonking V8 by downsizing to a 2-litre twin turbo four-cylinder, the first such time in AMG’s 45-plus year history they’ve done so. Said four-cylinder however pumps out 355bhp, meaning the CLA 45 not only outguns main competitors from BMW (316bhp M235i) and Subaru (301bhp WRX STI) but is also the world’s most powerful four-cylinder engine in series production, hence the 4.6 second zero-to-ton time. 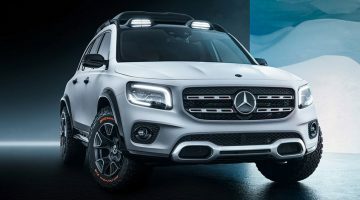 There’s the looks too, with muscular notes like the twin-blade radiator grille, bonnet grooves and AMG twin-spoke, 18-inch titanium grey alloys. All scream ‘Affalterbach’ (as for that matter do the AMG badges dotted about the fenders, floor mats, wheel rims and door sills). Our test model today is also an Edition 1, which brings a couple of natty extras like red detailing around the front grille – to match the seatbelts – centre locking AMG hub caps, a chrome-plated twin-pipe sports AMG exhaust system, and those not-so subtle racing decals (though those are quite sharp). So focused on performance over civility does the CLA appear to be that the entire boot is taken up with the spare wheel. How then is this ‘being sensible’, James? If the court will pardon my leaping off script and going technical for a second, I shall offer my rebuttal. Unlike their institutionalised brother – the C 63 AMG – both the new A 45 and the CLA boast 4MATIC all-wheel drive, and while this may seem an attempt from Affalterbach to collar AMG’s traditional lairiness, focus for the AWD system remains ‘firmly’ on performance and driving spirit. 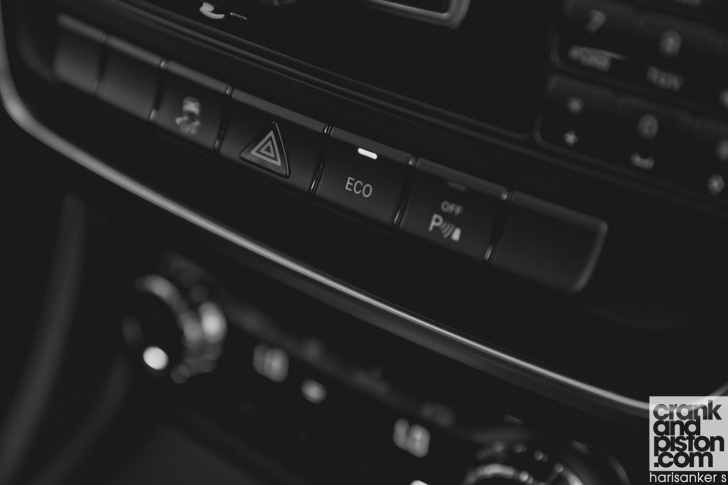 Ditto the AMG seven-speed shortshift gearbox, which despite helping the CLA return a 6.9L/100km fuel economy (good grief, is that a stop/start button? ), the transmission has been updated to offer smoother but swifter gear changes. But that’s not my pressing concern. The ESP Curve Dynamic Assist is. Working in conjunction with the all-wheel drive system, this system offers minute braking to the inner rear wheel under hard cornering to maintain traction. Few could argue with its effectiveness, since the CLA is pretty impressive through the corners. There’s little understeer at the front thanks to the ESP and surprisingly good grip from the Hankooks too. There’s barely anything close to bodyroll or lean either thanks to a low centre of gravity and clever weight distribution, and though in Comfort mode (sorry, ‘Controlled Efficiency’) the steering is a tad over-assisted, there’s ample weight in both Sport and Manual (ahem, ‘Momentary M Mode’) to keep the front end at bay. Thumbs up, everybody’s happy. So what’s the problem? 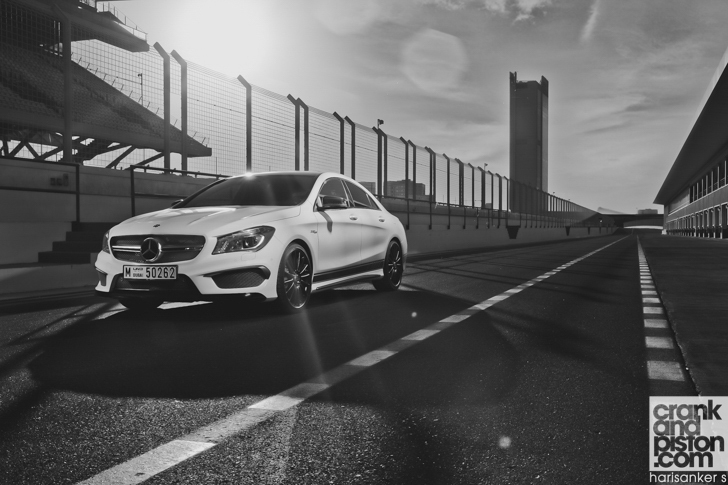 Quote: ESP Curve Dynamic Assist keeps the CLA 45 ‘under control at all times’. Under control at all times. 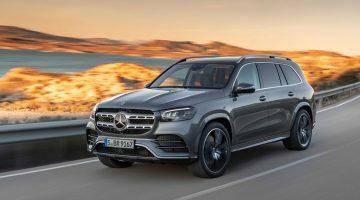 It’s a statement that seems at complete odds with the lunatic reputation built up – and much loved – by AMG, ridonculous amounts of power and lairiness being the key to spirited driving rather than precision. Does all-wheel drive not knacker that principal entirely? And if so, has Mercedes-Benz shot itself in the foot with the new CLA? Smaller the beating heart under the hood may be, but those 355 brake-horses pack a sizeable wallop under hard acceleration. The AWD system ranges from full front wheel drive to a 50:50 split, the 332lb ft of torque being allocated where it’s needed to stop the back end getting overly amorous or the front end too loaded. Rear wheels not attempting to bite you does take some of the drama out the AMG experience, though in fairness the sensation of speed is still intact. 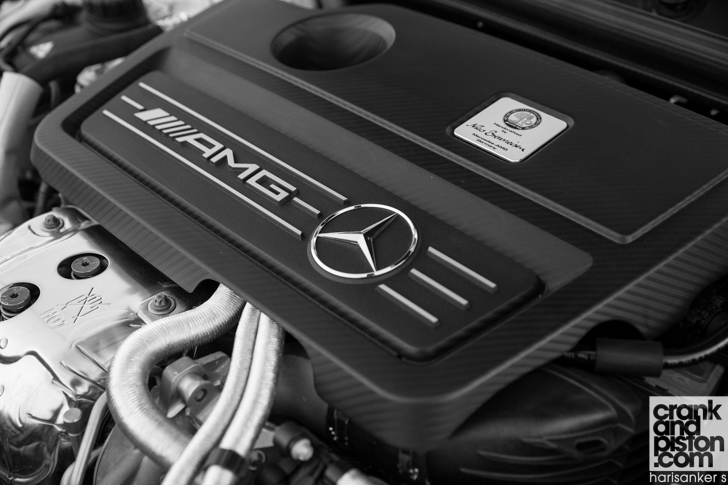 Keep the revs high under hard acceleration and the four-cylinder emits a typically throaty AMG tone. 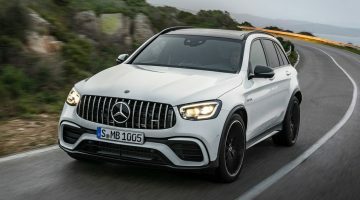 Joy of joys, AMG has seemingly taken heed of customer feedback too: go full banana in ‘M’ (give me a break, we’re short on space) and the speedshift box won’t cut in and change gear for you. Electronic nannying is gone, and the only thing to stop you hitting the rev limit is you. It’s all very composed, with a dash of energy thrown in. It’s impressive. It’s sporty. But is it an AMG? In the CL/SLS/AMG GT world of unleashed madness where only the hairiest of chests would venture, you’d say no. Consider though the AWD’s focus on ‘performance and driving spirit’: check and check, since even though the ‘spirit’ has been given a choke chain, the joie de vivre is still there thanks to buckets of grip, terrific balance and [shudders] ‘composure’, coupled with that mighty V8 soundtrack. It’s not lashing out and punching me in the fun zone, as I had expected, but the CLA 45 AMG has taken an altogether different approach to performance driving. It’s just a little more…sensible.